Bills Hall of Fame running back Thurman Thomas will be putting his taste buds to the ultimate test this evening, as he and a panel of experts judge the Taste NY Craft Beer Challenge finals. Held in New York City, the last installment in the state-wide competition will feature five finalists, including a few flavor-filled local breweries such as Bills Partners Southern Tier Brewing Company and Genesee. Identified by more than 42,000 voters as the top craft breweries in New York, from a list of over 70, the finalists will be analyzed using the following criteria: brewery’s diversity, range and quality. Each will have the opportunity to showcase some of their most popular products. For Southern Tier Brewing Company, the event will give the judges a chance to try their new IPA, Nu Skool. Follow along tonight from 5 – 7 p.m. to find out which brewery wins it all! 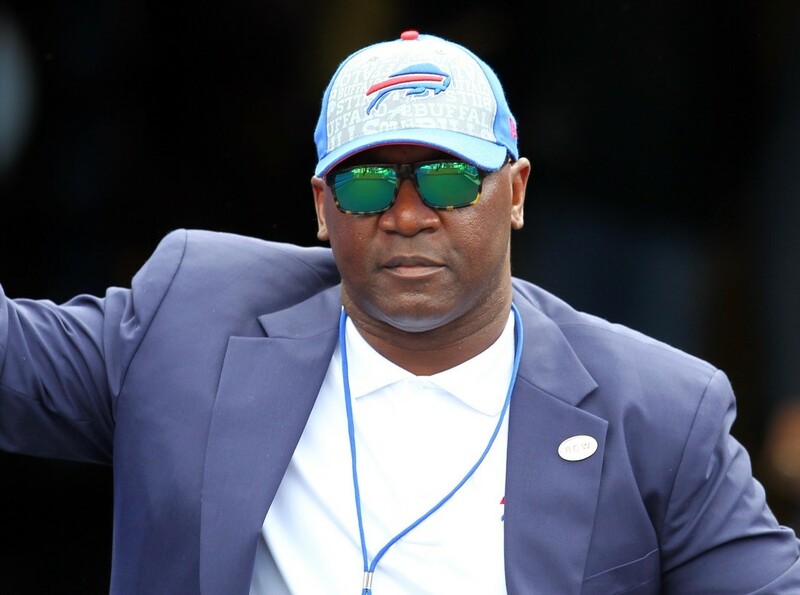 Throughout his 13 years in the NFL, former Bills running back Thurman Thomas was recognized several times for his efforts on the field. An influential member of the Western New York community, the Hall of Famer has also made a name for himself off the field. Thomas has been selected to receive the Legacy of Service Award on Friday, Nov. 18 at Niagara University’s President’s Dinner at the Seneca Niagara Resort and Casino. He was chosen based on his continued commitment to serving the community. Thomas and a group of other honorees will be acknowledged during the dinner, which begins at 6 p.m. Proceeds from the evening will benefit the university’s scholarship programs. For more information on how to purchase tickets to the dinner, please visit here. With today’s announcement by Bills team President Russ Brandon that the club will be retiring Bruce Smith’s No. 78 in a halftime ceremony at the Bills home opener, he was naturally asked about whether Thurman Thomas’ No. 34 could be next in line. Right now only Jim Kelly’s No. 12 is retired. Smith’s 78 will follow in September. Thomas sounds likely to follow soon after. Bills secondary coach Tim McDonald is entering his second season with Buffalo on Rex Ryan’s staff. His 13-year playing career was highlighted by a Super Bowl title with the San Francisco 49ers in 1995. McDonald signed as a free agent with San Fran in 1993, a move that might not have happened were it not for a certain game the 49ers had played a season prior against the Buffalo Bills. In 1992 the Bills and 49ers met early in the season in the now famous ‘No Punt’ game won by Buffalo 34-31. Though the Niners had a respectable defense that ranked 15th in the NFL, San Fran was 26th in pass defense and 24th in interceptions. And in a heated arms race with the Dallas Cowboys for NFC supremacy, the 49ers were looking for free agent help in the secondary. McDonald, who was a Phoenix Cardinals free agent, was given a five-year contract offer worth big money at the time ($12.75M). McDonald believes it never would’ve happened were it not for the Bills-49ers ‘no punt’ game where the defense was non-existent. “What got me to San Francisco as a free agent was their need for defensive help,” McDonald told Buffalobills.com. “San Francisco offered me a pretty good deal because they played that game – and I talked to Jim Kelly and Thurman Thomas about this – they played a game against the Buffalo Bills in 1992 and there were no punts. McDonald had a staff of big names that he played under at the time. 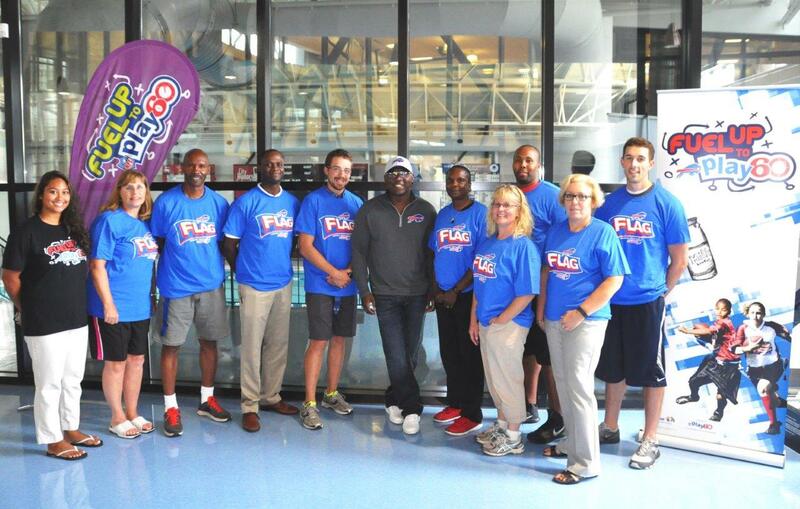 Thurman Thomas joined the American Dairy Association on September 2nd to train 100 Buffalo City School District physical education teachers on the NFL FLAG Football program as a part of the Fuel Up To Play 60 initiative. The training, hosted at City Honors High School in Buffalo, was hosted by SHAPE America and comprised of the teachers learning how to run the NFL FLAG curriculum in their classroom. During the NFL Draft, Commission Goodell and others announced the second year of distribution for “Fuel Up to Play 60 NFL FLAG Essentials Kits” in 2015 to physical education teachers across the country. Buffalo was 1 of 10 NFL markets selected to receive NFL FLAG Football Essentials kits and will receive 46 kits that will be distributed to all of the Buffalo Public elementary schools. These NFL FLAG Essentials Kits will help increase students’ physical activity in-school and at home through a package of equipment, curriculum, online training, and recognition. NFL, USA Football, and Fuel Up to Play 60 are expanding their commitment to youth health and wellness by giving NFL FLAG Essentials Kits to over one million students across 2,500 schools nationwide for the 2015-16 school year. 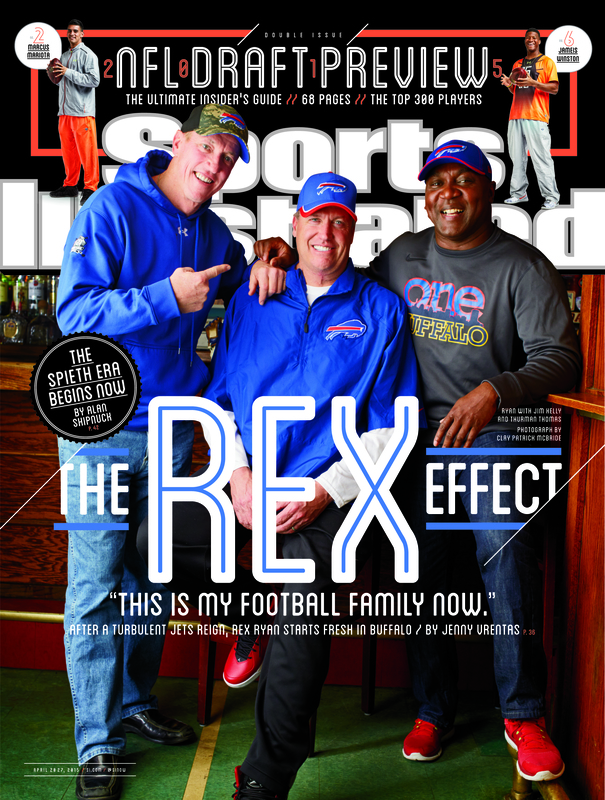 For those that haven’t seen it yet, here’s the Rex Ryan Sports Illustrated cover with Bills Hall of Famers Jim Kelly and Thurman Thomas. It’s a regional cover, not a national cover for the magazine to go along with the story by Jenny Vrentas. With so much positive news packed into one week for Bills fans, the 73-thousand plus at Ralph Wilson Stadium Sunday were just hoping the team would cap the week with a win. Doug Marrone’s men obliged taking a day when the man who founded the franchise was honored, and two of the team’s most famous alumni presented the late Hall of Fame owner’s wife, Mary Wilson, with an honorary Wall of Fame ring. That combined with the Pegula agreement to purchase the franchise and keep it in Western New York brought the week to a fitting conclusion. When asked what Mr. Wilson might’ve thought of the performance Sunday, Brandon believed his former boss would’ve loved it. He played in Buffalo, coached in Buffalo, and made many friends along the way. Tonight, former Bills QB Alex Van Pelt joins us on The John Murphy Show. Van Pelt just wrapped up his first year as the Running Backs Coach for the Green Bay Packers, after two years before that with Tampa Bay. The Pack saw their season end with their divisional round playoff loss in San Francisco last Saturday night. Tonight, Alex Van Pelt joins us at 720pm and we’ll ask about the Packers season, and about the injury-plagued season of Niagara Falls native James Starks, a Green Bay running back. We’ll also get Alex’s take on the Bills new Offensive Coordinator Nathaniel Hackett. Van Pelt and Hackett worked closely together in 2008-09 when both were members of the Bills offensive coaching staff. Hall of Fame running back Thurman Thomas joins us in studio at 8pm for his usual weekly visit. Thurman always has fresh and original takes on the Bills and the NFL. And at 820pm, another former Bills player, Bucky Brooks, will be on the line with us from the East-West Shrine Game in St Petersburg, Florida. Brooks was Buffalo’s 2nd round draft pick in 1994 out of North Carolina. Since his playing days ended, he’s become a personnel man in the NFL, working with the Seahawks and Panthers. And for the last few years, he’s become a draft expert for the NFL Network and NFL.com. We’ll ask Bucky about the prospects in the upcoming draft. We always have time for phone calls and comments from listeners. The John Murphy Show airs weeknights from 7pm-9pm on the flagship station of the Bills, WGR Sports Radio 550. It’s the big news of the day at One Bills Drive, the multi-year contract extension signed by guard Kraig Urbik. It’s a great story. Urbik was claimed off waivers by the Bills in September, 2010, after washing out as a third round draft pick in Pittsburgh. We’ll talk with Urbik tonight on The John Murphy Show tonight. He joins us at 7:20pm to address the slow start to his NFL career, and moving forward with what he believes are a core group of players on the Bills offense. At 8pm tonight, Hall of Fame RB Thurman Thomas joins us for his usual Tuesday night appearance. C.J. Spiller continues to climb up the Bills rushing charts, and we’ll check in with Thurman for his take on Spiller and the loss in Toronto two days ago. There’s a new book about the NFL called “Coaching Confidential-Inside the Fraternity of NFL Coaches.” Longtime Pro Football writer Gary Myers of the NY Daily News is the author, and he’ll join us live at 8:20 tonight to talk about the book, and the circus that is the New York Jets. As always, we’ll cover the news of the day from One Bills Drive, and we’ll make time for phone calls from fans. We’ve got quite a lineup tonight on The John Murphy Show, as the Bills prep for their appearance in the prime time spotlight Thursday night. We’ll start with Quarterback Ryan Fitzpatrick at 7:20pm. We’ll talk to Fitz about the uptick in offensive production in recent weeks, and the disappointing end to the Patriots game last Sunday. We’ll also look ahead to the game against the Dolphins Thursday. At 8pm, Hall of Fame Running Back Thurman Thomas makes his usual Tuesday night appearance in studio with us. Thurman played for both the Bills and the Dolphins during his NFL career. At 8:20pm, we’ll talk to another Hall of Famer. Former Dolphins Quarterback Bob Griese joins us live from South Florida, where he’s the color commentator on the Dolphins radio network. He’s also the co-author of a new book celebrating the 40th anniversary of Miami’s perfect season. The book is called “Perfection: the Inside Story of the 1972 Miami Dolphins Perfect Season.” We’ll ask Griese about his memories from that season, and what to expect from the Dolphins this week at Ralph Wilson Stadium. As usual, we’ll take your phone calls and have updates on the latest from the Bills and the NFL. Players day off–coaches day on at One Bills Drive. We’ll start talking about the matchup with the Houston Texans tonight on The John Murphy show. Bills running back Fred Jackson joins us in studio at 7:20pm. We’ll talk to Fred about the benefits of the bye week, his struggle coming back from his opening day knee injury, and sharing the running game workload with his talented teammate C.J. Spiller. Hall of Fame running back Thurman Thomas joins us live in studio at 8pm. Thurman makes his regular Tuesday night appearance, and tonight we’ll get his take on the Bills after the bye week. And we’ll go back into the Bills past at 8:20pm when former punter Chris Mohr joins us live on the line from his home in Georgia. Mohr will be back in Buffalo in early December when he’s presented with the Ralph C. Wilson, Jr. Distinguished Service Award. As always, we’ll cover the news of the day from the Bills and the NFL, and we’ll make time for your phone calls. Fred Jackson has quickly climbed the ladder of best total yards from scrimmage seasons in Bills history this season. Heading into Sunday’s game against Washington he sat 8th all time among Bills all-time scrimmage yard leaders. Following his 194-yard effort he vaulted himself into second. In games 1-7 in any Bills season, O.J. Simpson is still the leader with 1,106 yards from scrimage in 1975. But Fred Jackson has bested Simpson’s start to his 1973 season when he compiled 1,073 yards in the first seven games. Jackson has 1,074 yards from scrimmage in his first seven games this season putting him in between Simpson’s two most productive years in a Bills uniform. 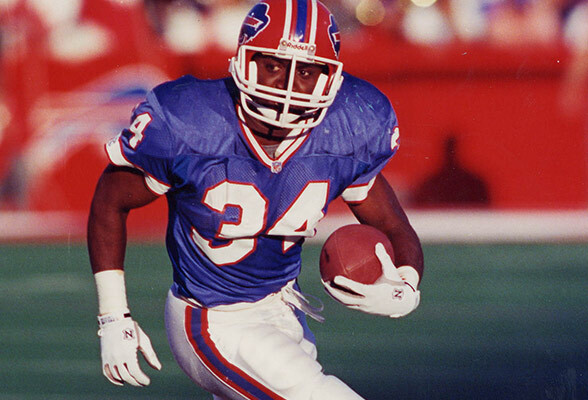 Thurman Thomas’ MVP season of 1991 (1,032 yards) now stands fourth. Fred Jackson is ranking high on another Bills team list with his big 196-yard effort Sunday, in addition to being among the league leaders in total yards from scrimmage. Jackson’s 712 yards from scrimmage through the first five games of 2011 are the fourth-most in team history. He’s the first player with 700 or more yards from scrimmage in Games 1-5 in 20 years – Thurman Thomas in 1991, and that was Thurman’s MVP season (hint, hint). Here’s the rundown of best five-game starts in Bills history for total yards from scrimmage. Two Bills HOF’ers Jim Kelly and Thurman Thomas were part of the 1st Gridiron Greats football camp down in Georgia earlier this month. Kelly, Thomas and a handful of other NFL players inclunding former Bills CB Kenny Irvin were instructors at the camp for players. Taking place at the brand new facilities at the University of West Georgia from June 15th-18th the former players are not only there to help young aspiring players, but also to help their fellow NFL Alumni in need. Gridiron Greats is a non-profit organization that provides financial assistance to retired NFL players. 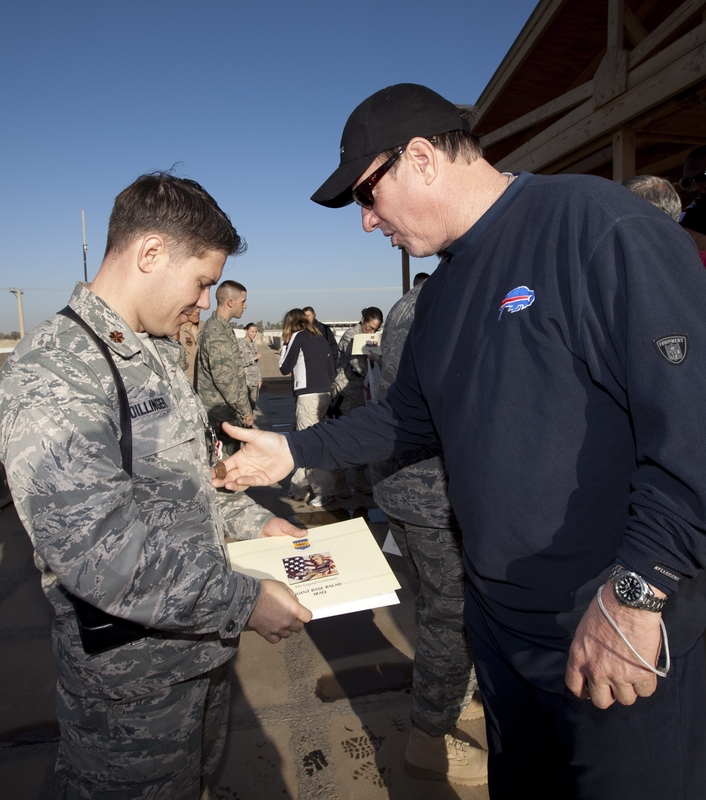 Bills Hall of Fame QB Jim Kelly along with fellow Hall of Famer Thurman Thomas and Bills Wall of Famer Andre Reed are visiting with the troops overseas in Iraq this week to give them a taste of Bowl season. Kelly and Rodney Peete will be squaring off in a flag football “Connect to Home Bowl” this week, with troops from the Army and the Air Force as teammates. Kelly and Peete appeared on CNN to talk up their efforts overseas. Highlights of the troops “bowl game” with Kelly, Thomas and Reed will be aired during halftime of the Fiesta Bowl between Oklahoma and Connecticut. Bills top pick C.J. Spiller is trying to remain as patient as possible concerning his rookie contract negotiations. Apparently though people/fans have been bugging him on twitter. Bills HOF RB Thurman Thomas, who has struck up a friendship with Spiller, offered to assist the rookie running back. thurmanthomas @CJSPILLER let me handle them, you just keep working out. Earlier in the day on his twitter account Bills Hall of Famer Thurman Thomas encouraged Bills top pick C.J. Spiller to get in touch with him by phone. Apparently Spiller did. After his conversation with Spiller, Thomas is about as excited as he can get over a Bills rookie. Here’s his latest twitter post. thurmanthomas Just talked to @Lightning28, OMG, I hope he breaks all the Bills rushing records. Great Kid that will lead them back to the promise land…. Most people that have met Spiller wind up saying a lot of the same things Thomas expressed in his tweet in terms of the type of person Spiller is. After one phone conversation with Spiller, Thurman is totally fine with this rookie breaking all his team rushing records. That speaks volumes. Add in the fact that he’s an intense competitor and there should be some good stuff from him on the field this weekend at Bills Rookie camp. Bills Hall of Famer Thurman Thomas has a soft spot for former Houston Oilers head coach Jerry Glanville. As he mentioned in his draft day memories of 1988, leading up to the draft Glanville was pushing the Oilers hard to draft Thomas, which would’ve been fine with the Houston native. “Being a hometown guy every time I see Jerry I thank him for pushing the Oilers to have an opportunity to draft me,” said Thomas. Thomas remembers all the doubters that were out there that weren’t sure if Thomas’ knee would hold up over the long haul after partially tearing his ACL his junior year. So he appreciates the guys that believed in him before he did anything in the NFL. Of course the Oilers ultimately passed on Thomas in round one of the 1988 draft, choosing instead to take RB Lorenzo White, one of seven to come off the board before Thomas. Had Thomas been taken by Houston he likely would’ve had 700 receptions in his career in the Oilers’ run and shoot offense, but Thomas wonders about his rushing totals.